You may find this information if using the site for the first time. The site has been designed to be "user-friendly". It is recommended that you start by opening the List of Maps page. Here you will find a complete list of the maps included on this site numbered according to the convention used in The Printed Maps of Devon (Second Edition, 2008). Choose the map to be consulted, or simply start with the first map, James Pigot`s 1839 map. Click the date 1839 to view an image of the map; click James Pigot to view the text information. Once a page is opened there are four choices for continuing. 2. Click on Text or Map Image to switch between the text on the relevant map or the image which accompanies that text: i.e. If you are on the text page to map 143 (W J Sackett), clicking Map Image will bring you to the relevant image; if you are on the image page to map 143, clicking Text will bring you to the relevant text page. 3. Click Next: if you are on a text page you will go forward to the next page of text, i.e. the next map entry. If you are on an image page you will go to the image of the next entry. E.g. if you are viewing the image to W J Sackett (143) you will go to the next image – No. 144 W Hughes. E.g. if you are reading the text to T Spargo (145) you will go to the next text entry – No. 146 H James. 4. Click Last: if you are on a text page you will go back to the previous page of text, i.e. the last map entry. If you are on an image page you will go to the image of the previous entry. E.g. if you are viewing the image to Thomas Murby (151) you will go to the last image – No. 150A Stanford / Symons (A denoting a later addition to the cartobibliography). E.g. if you are reading the text to Thomas Murby (151) you will go to the previous text entry – No. 150A Stanford / Symons. When searching for town names please note that the spelling of these varied over the years (e.g. Okehampton and Oakhampton) and both names might have been used when referring to names as used on maps. You may need to use more than one spelling if looking for specific placenames. For the purpose of this cartobibliography, a county map of Devon is a printed map published specifically to show the whole of Devonshire on one or two sheets, either individually, or with only one other complete county. Devon was not grouped with other counties in any of the atlases included in the current work; however, one geological work (118 - two maps), four ecclesiastical works including a magazine (118A, 129, 139 and 143, showing the Diocese of the Bishop of Exeter), a number of guide books (130, 135, 137, 157. 165A and 175), The Western Morning News (159), Stanford’s Large Scale Railway Map (154A), Weller's sketch maps for Samuel Gardiner (170A) and Firks and Son large wall map (170) show Devon together with Cornwall. These are all included. There is one exception. Black's revised Guide to South of England (the spine title, 142) originally had a map of Dorset, Devon and Cornwall, which was later cut into two maps Dorset and Devon & Cornwall, or the three separate counties. As all of these maps were taken from the same plate the first stage has been included. Cassell's produced a railway guide, and Gall & Inglis a cyclist's road book: both of these have maps of the county. As they show the majority of the county they have been included (165 and 182). The Gall & Inglis map is also of Devon and Cornwall. Two key maps have also been included: the key map of Bartholomew/Black (1882, 156) which depicts Devon; and the index map of Baddeley and Ward's Thorough Guide Series which depicts Devon and Cornwall (1882, 157). Both these maps were printed on the inside front covers. Other index maps have not been catalogued, as either too small to provide real information or as they are unlikely to be found loose. An illustration of Henry de la Beche's rough sketch map of Devon is shown (illustrated under 118) as is the small index map by W J Sackett (80 x 60 mm) shown above the list of the Diocese (illustrated under 143). 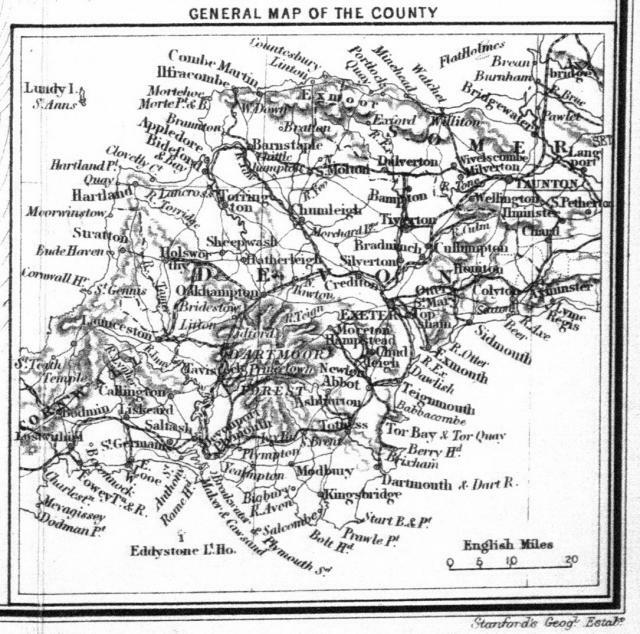 In addition there were three small maps in Faunthorpe's work (illustrated under 149) and an inset map on Stanford's map of South Devon included a General Map of the County. The inset map on Stanford’s map of South Devon (154). Maps of Devon which show only part of the county, coastal charts and road books are also excluded. It is hoped further volumes will list these. Maps of Devon from 1575 to 1837 can be found on the website The Printed Maps of Devon; maps of the towns and regions of Devon to 1901 can be found in The Tourist Maps of Devon; maps of Exeter only can be found in The Printed Maps of Exeter; and for road books see Francis Bennett, The Road-Books, Road-Maps, & Itineraries of Great Britain 1535 to 1850; and The Roads of Devon and Cornwall. Both books published by the author and printed by the Short Run Press, 2008. See also the Bibliography page which lists other useful books on Devon cartography. Maps covering the South-West, and coastal charts are excluded. It is hoped that further volumes will list these. In labelling the maps the chosen order of preference throughout is surveyor, draughtsman, engraver, author and publisher. The map is given the name of a surveyor, if known, where the map is believed to be the result of an original survey. Otherwise the name of the draughtsman, the engraver, the author of the original work, or the first publisher in that order is used to help in identification. Names joined by a slash, e.g. Emslie / Reynolds, indicate that both (or all) were connected with the original issue and both (or all) names are found in works of reference and/or dealer’s catalogues in connection with this map. A slash is also used to identify separate works by the same draughtsman or engraver, e.g. Bartholomew/ Black and Bartholomew/Pattison. In some cases maps are commonly associated with another mapmaker or publisher, e.g. Weller’s map (1858) for the Weekly Dispatch newspaper (136), or a later publisher, e.g. Bacon’s publication of Cary’s maps: in these cases the alternative name is added in brackets, e.g. Bacon (Cary). The main entry shows the title and features that appeared on the first edition of the map. Subsequent states, with a note of the variations, are listed below. Information is complete up to the year 1901. Information on issues is largely correct but must be treated with caution where there were many reissues, eg Bacon reissues of the Weekly Dispatch sheets from 1864 (136c). The first date is the date of issue of the atlas etc. or the date printed on the map, whichever is the earlier. Reissues with information on known changes follow. Facing each description is an illustration of one issue of the map. After the description of an edition of each map there is a list of the titles of atlases, books or other publications in which the map appeared. The title (which may be shortened, omissions being shown by dots) is given in italics, using the original spelling but in lower case except for initial letters. This is followed by the place, the publisher and the year of publication. If the year is shown without brackets, e.g. 1839, this is the date given on the title page. If more than one date is shown, separated by commas, these are the dates of successive editions of the same publication. If the date is shown in the form 1882 (1892), this means that although 1882 is the date on the title page, there is other evidence to indicate a later (or earlier) publication. Dates in brackets alone, e.g. (1845), indicate date is conjectured.